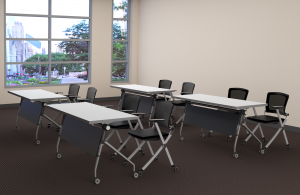 Compel Office Furniture offers a wide variety of training tables, from compact portable tables to versatile stationery tables, all with a variety of options. Compel training tables are an excellent solution for corporate training rooms, classrooms, conference areas or any multipurpose work environment. If you are looking for something more ergonomic in nature, try our height adjustable line. 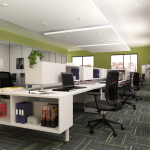 Our HiLo will revolutionize your office. With an easy to use of a keypad, set your desk to any height you desire, and save your favorite heights with 4 memory settings. If you’re looking for something with more utility, try our Pax table. With just a pull of a handle, you can transform a side table with a modern style into a perfect podium. We also have multipurpose seating that goes hand in hand with our tables. 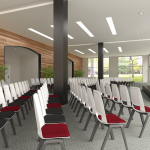 Our Fila chair is a perfect guest chair while its ganging capabilities also make it work well in waiting rooms and auditoriums. Our Konnekt line is great for your lunch room and break room needs, be it standard sitting height, or at a bar. Be it seating or tables, Compel has the solution for all your multipurpose needs.